GCU women’s basketball coach Nicole Powell hands a box containing a frozen turkey to Thunder for loading in a car trunk. 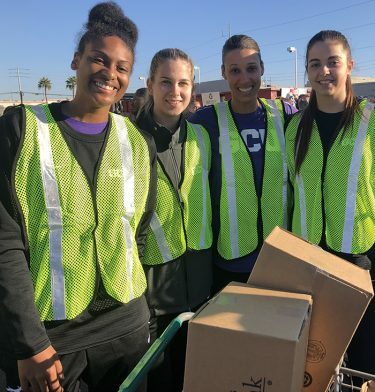 Before members of the Grand Canyon University women’s basketball team thank God and break bread for a Thanksgiving dinner at the home of their inspirational coach, Nicole Powell, they helped make the holiday meal special for dozens of Arizona families. 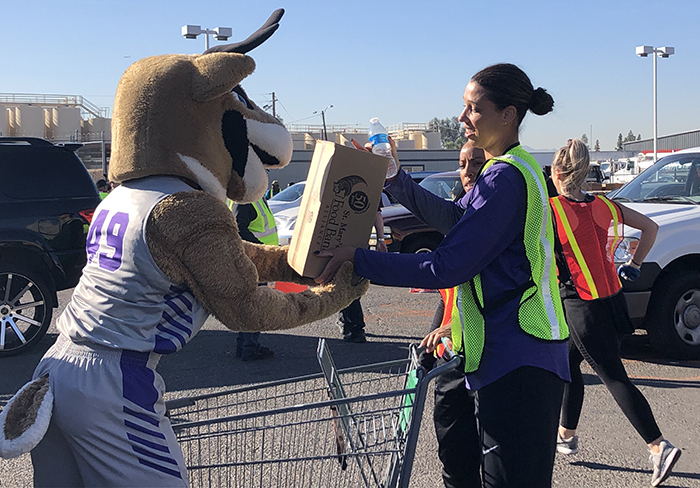 The Lopes, who returned late Saturday from a five-day road trip to North Carolina, woke up before dawn Monday to volunteer at the St. Mary’s Food Bank Alliance Turkey Distribution. Like NASCAR pit crew members, they waited in line with full shopping carts of food, then approached their designated car in one of six lanes to quickly fill the trunk with turkey, bread, onions, carrots, potatoes, peas, pinto beans, canned goods, watermelon and eggs — 12,000 dozen were donated by Hickman’s Family Farms. As an Ahwatukee native, Powell is familiar with food insecurity in the Valley and the mission of the SMFBA. From left, AJ Cephas, Venla Varis, coach Nicole Powell and Carla Balague rose early to distribute food. As she manned a teeming cart of food, GCU redshirt senior AJ Cephas recalled similar initiatives as a youngster in Northern California. According to Powell, it is in the Lopes’ DNA. While shifting uncomfortably in a heavy boot that stretched from her sprained ankle to just below her knee, freshman Taylor Caldwell embraced that perspective. “It’s kind of uncomfortable, but this is such a good cause that no matter the pain or discomfort, you just have to get out here and do it,’’ she said. 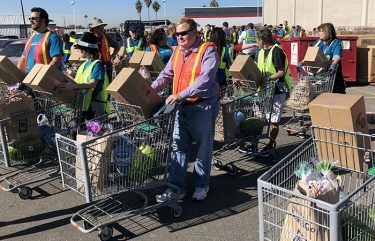 As people gratefully picked up their food by car or on foot, Tom Kertis, President and CEO of SMFBA, estimated that 12,000 Thanksgiving meals would be distributed between Monday and Wednesday. 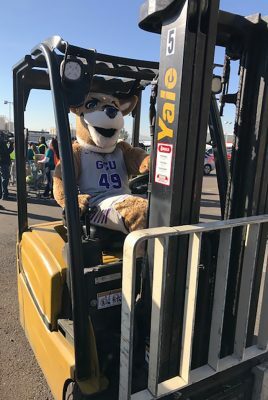 “Each meal feeds eight to 10 people, so over 100,000 people will be fed over the next three days,’’ he said, noting that GCU adds to an efficient volunteer system, which moves 770 cars per hour through six distribution lanes. “GCU is heavily involved with St. Mary’s Food Bank Alliance and with helping fill a need in the community,’’ he said. Dr. Sherman Elliott, the Dean of the College of Humanities and Social Sciences, waits his turn to load a car. Along with the women’s basketball team, women’s volleyball staff members distributed food, Thunder kept the mood light, and the College of Humanities and Social Sciences pitched in via Dr. Sherman Elliott, Dean of the CHSS, and four members of his administration: Assistant Dean Dr. Noé Vargas, Kathleen Britton, Jacqueline Webster and Tanisha Guy. It was the third year of participation for Elliott, who worked in the warehouse and in the distribution lanes. GCU’s multiple-front contributions included the baseball team’s Super Saturday participation, rallying shoppers at Safeway to donate turkeys, canned goods or monetary donations, and the annual Give with a Purpose Turkey Drive aimed at employees, who were encouraged to donate time, turkeys or monetarily. The dollar-for-dollar match from both the University and Pono Construction will triple employee contributions. Thunder temporarily took over forklift duties. Carla Balague, a freshman from Barcelona, saw the end result of that generosity as each person drove off with several bags of food and a frozen turkey. “It is amazing to see that you are helping make people happy,’’ she said. Balague, fellow Spaniard Laura Piera, Venla Varis from Finland and Kavita Akula from India will experience an American Thanksgiving for the first time. Between film study and practice in preparation for their Thanksgiving Showdown tournament game at noon Friday versus Indiana State at GCU Arena, Powell plans to seek a major cooking assist from A.J.’s Fine Foods. Not only is she excited to play Thanksgiving dinner hostess for her international players, she understands that her American players will likely view the day of gratitude through a new lens because of the presence of teammates from a wide variety of backdrops. 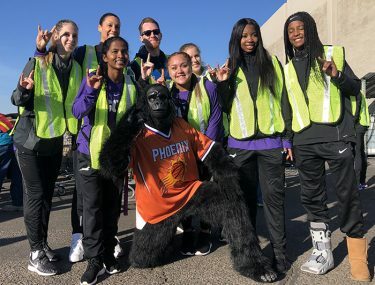 Front row, from left: Kavita Akula, Gorilla (Phoenix Suns mascot), Sharon Miller, Taylor Howard and Taylor Caldwell. Back row, from left: Venla Varis, coach Nicole Powell, video coordinator McGhee Mann, Laura Piera. And it is easier to take it easy knowing they’ve eased the burden of Arizonans in need.